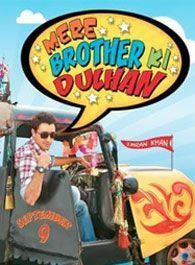 "Mere Brother Ki Dulhan" is a quirky romantic comedy set in the world of the upper middle class in Northern India. Kush Agnihotri (Imran Khan) is looking for the ideal Indian bride for his Brother Luv Agnihotri (Ali Zafar) who stays in London. In his quest, Kush goes through an array of wacky encounters with several families until he finally finds that perfect girl in Dimple Dixit (Katrina Kaif), the craziest / wackiest girl he has ever known. Omg i just finished watching the movie and ahhh I loveee ittt!!! The Story And The Songs Were All Good. I Specially Loved The Luv's Character. I Just Loved His Smile Too. And Ali (The Director) I Would Like To Say Thank You Thank You Thank You Very Much For Making A Movie Like Mere Brother Ki Dulhan.